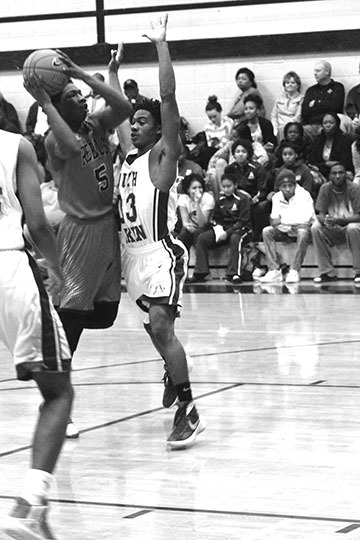 Strom Thurmond’s #5 launches shot against South Aiken in Savannah River Shootout action. The Rebels of Strom Thurmond High School finished third in the first Savannah River Shootout at North Augusta. The Rebels started the tournament against Jones County winning 77 to 62 in first round action. Strom Thurmond stats for the game: Tre Moore 8 3-4 19, Shuron Burt 6 0-0 15, Jamal Stevens 4 4-6 14, Tay Merriweather 5 0-0 10, Dante Stover 4 0-0 8, Onesis Brown 2 1-3 5, Rod Dobbs 2 0-0 4, Tyrese Holloway 0 1-2 1, Devontae Williams 0 1-2 1. Totals 31 10-17 77. 3-pointers: Burt (3), Stevens (2). In second round action the Thurmond men lost a close one to the eventual tournament champions South Aiken by a score of 43 to 36. Rebel stats for the loss: Rob Dobbs 4 1-2 9, Jamal Stevens 3 0-0 8, Tre Moore 3 0-0 6, Dante Stover 2 2-5 6, Shuron Burt 2 0-0 5, Onesis Brown 1 0-0 2, Tyrese Holloway 0 0-2 0. Totals 15 3-9 36. 3-pointers: Stevens (2), Burt. Strom Thurmond entered the consolation game having to defeat a Grovetown team that had demonstrated a propensity for three-point shooting. 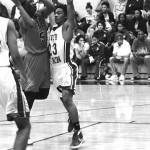 The Rebel defense smothered the Grovetown Warriors cutting their normal three point production in half sending the Rebels to a third place finish for the tournament. Strom Thurmond stats for the win: Tre Moore 7 1-4 15, Shuron Burt 6 1-4 15, Dante Stover 3 6-12 12, Rod Dobbs 3 3-4 9, Tyrese Holloway 2 2-4 6, Rysheem Dugar 1 2-3 4. Totals 22 15-31 61. 3-pointers: Burt (2).